Designed as an integrated addition to the REMstar family of CPAP and BiPAP devices, this unique, tubeless platform brings heated humidification to a new level. All REMstar units operate with the same easy-to-use Heated Humidification System. The lighted controls are right on the CPAP, so they're always easy to find. And since the platform plugs directly into the CPAP unit, there's no additional power cord and only one plug to go into the wall. The clear, two-piece water chamber is easy to fill and is dishwasher safe. 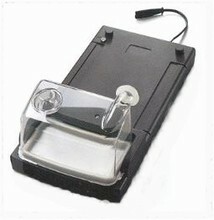 Note: this unit will only work with specific Respironics REMstar CPAP and BiPAP machines that look like this. Unique, tubeless design that works with the new REMstar family. Its simple rubber coupler connection provides secure contact between the water chamber and the CPAP. Clear, two-piece water chamber that's easy to fill and is dishwasher safe. Heater plate status light makes it easy to see when the humidifier is on or off. The Heated Humidifier plugs directly into the REMstar - so there is only one plug going from the CPAP to the wall outlet. Dimensions: 13.25" x 6.5" x 2.125"
Content of Package: REMstar Heated Humidifier base, One water chamber, User manual, and 2 Heated Humidifier couplings. My supply store no longer had this part in stock. Received my order within 4 days. Product arrived within five days and I am pleased with the operation of the Humidifier. The item was shipped within one day. Easy to operate and refill. Does not over heat like other models I have had in the past. Only problem was not having clear instruction in the manual. Other then that it is a great machine.